The drive lines of turbo engines must be designed such that the difference between the structural resonances and the operating speed is sufficiently large. In order to achieve this, it is necessary that the natural frequencies of the components such as turbines, compressors and couplings have a sufficient distance to the operating speed. A final assessment should include the complete drive line. While designing diaphragm couplings for drive lines, the lowest natural frequencies for the structure should be well known, if possible already during the project defining process. Therefore, DIABEAM, an easy-to-use FEA software for users without advanced FE knowledge, was developed. As inputs, DIABEAM needs the geometric and material data of connection flanges and spacers as well as the positions and the stiffness of bearings. An adequate modeling of bosses and spacers by beam elements and the integration of the kinematics of the diaphragm elements is done automatically. The stiffness and mass matrices of the double diaphragm elements are stored in databases. 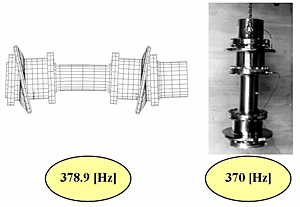 As results of DIABEAM, the lowest natural frequencies for bending vibrations are obtained for arbitrary bearing conditions and the referring mode shapes are visualized and exported for datasheets or reports. 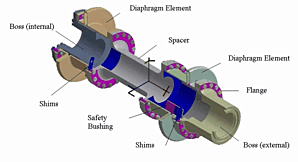 Diaphragm couplings as single components as well as complete drive lines can be investigated. The accuracy of DIABEAM can be stated to be better than 5% due to comparison with simulations using the commercial FEA software I-DEAS and with measurements. 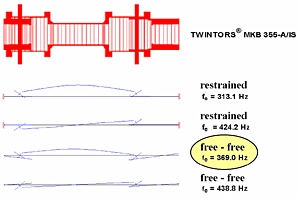 This allows a reliable assessment of the bending vibration behavior of diaphragm couplings.